It’s no secret that cancer and its associated treatments can take their toll on an individual – physically and psychologically. Even though exercise may be the last thing you want to do right now, research conclusively demonstrates that it can have a profound impact on your recovery! At Maple Tree, we operate under the motto that “Something is always better than nothing”. This means that even on the days when you feel like you are too tired to leave your house – even just a quick walk around your yard will help boost your energy, mood, and outlook! When you are looking to add exercise into your daily life, there are four types of exercise you want to be sure to include – this will maximize your health and help reduce your symptom severity! Aerobic Exercise: Aerobic Exercise includes sustained exercises that stimulate your heart and lungs and improve your body’s utilization and delivery of oxygen. This can include walking, swimming, or cycling. Ideally, you should strive for 150 minutes of aerobic exercise each week. This can be broken up into 30 minutes a day for 5 days a week. When beginning an aerobic exercise program, be sure to pick something you like! If you don’t enjoy it, you won’t want to continue doing it! Make sure that you are able to carry on a conversation during your aerobic exercise session. If you cannot talk, you are exercising too hard! Slow it down and be sure to breathe throughout! Strength Training: Strength training involves exercises performed with dumbbells, bands, ropes, medicine balls, cables, and/or weight machines. These types of exercises are aimed at improving muscular strength and endurance, as well as bone density. When performing strength training, strive to complete 2-3 sets of 8-10 repetitions of each exercise. At Maple Tree, we recommend using a full body workout – hitting all the major muscle groups. Be sure to use proper form for each exercise and breathe throughout. Many people have the tendency to hold their breath when they exercise, which can substantially increase blood pressure and cause you to pass out. As a general rule of thumb, inhale on the push and exhale on the pull! Please note that the old saying “No pain, no gain” does NOT apply here! If any movement you do hurts, stop doing it immediately and seek the help of a professional. 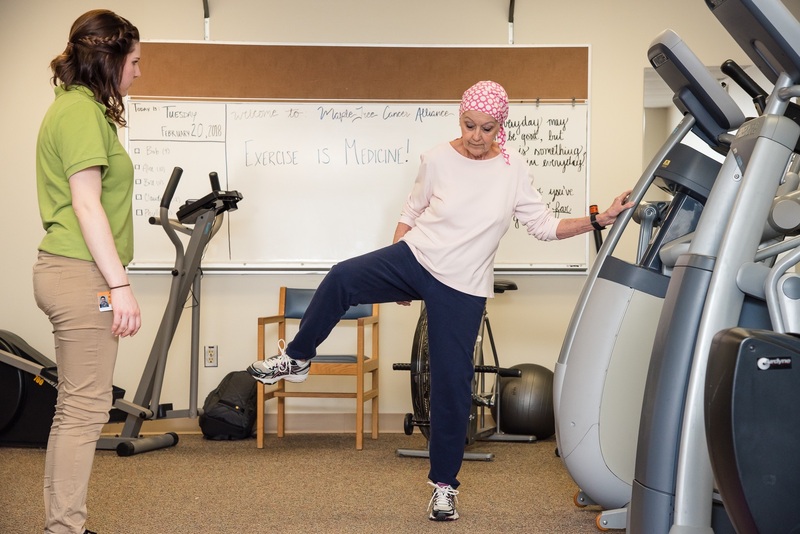 Balance Exercises: Sometimes, cancer treatments can cause a reduction in balance, leading to an increased risk of falls. Therefore, exercise programs should include balance exercises. Some balance exercises can be as simple as walking a narrow line, single leg stands, and heel raises. Stretching: Flexibility is the most neglected component of fitness – whether you have cancer or not! However, it is especially important in those who have undergone cancer treatments – which often can severely limit range of motion. Stretching can help a patient regain mobility in these areas! When stretching, be sure to slowly stretch to the point of muscle tightness, not pain. Once this point is reached, hold that position for 10-30 seconds. Be careful not to bounce or hold your breath. To summarize, exercise is safe and effective during and after cancer treatment. These four types of exercise should help get you on the right track to incorporating exercise into your every day life! It is always best to work with a trained exercise professional, with a certification in exercise oncology. Finally, be sure to obtain clearance to exercise from your attending physician.